Okay so I haven’t updated this in a year! Hope to do better in 2016 Here’s a start, of the concerts mentioned here I’m producing the the opening nightFebruary 3: Africa/India Series, Residency Launch Party February 24: George Harrison Birthday/ Beatles Tribute, April 13: Raga CubanaApril 20: The Raga Remains the Same, but will be involved in all of them. Pioneer Works is an amazing venue, our favorite by far in Brooklyn. Launching with an Africa/India Concert on February 3rd, BRM’s Pioneer Works residency will consist of multi-disciplinary performances, recording sessions, educational offerings and podcasts. For every Wednesday in February, March and April, BRM will bring their weekly series to Pioneer Works with greatly expanded programming, including themed nights (Women’s Night, Dance, Africa/India), tributes to musical legends from East (Ravi Shankar) and West (George Harrison) and special guest artists, such as Pt. Krishna Bhatt, Karsh Kale and Kiran Ahluwalia. Before each concert, BRM will host related workshops and film screenings, while during the concert, Bombay Sandwich Co. will provide delicious culinary offerings. BRM artists will also lead a special educational series on Thursday nights entitled Shruti and Laya: an Embodied Experience of Sound Through Indian Music. The recording studio at Pioneer Works will be utilised by BRM each week as their members engage in a collaborative composition project. These studio recordings, in addition to live concert recordings from the whole residency, will be used to create a new BRM compilation album defined by its residency at Pioneer Works. Video from the concerts, studio and interviews will comprise a documentary film and video shorts, further defining this bold partnership. 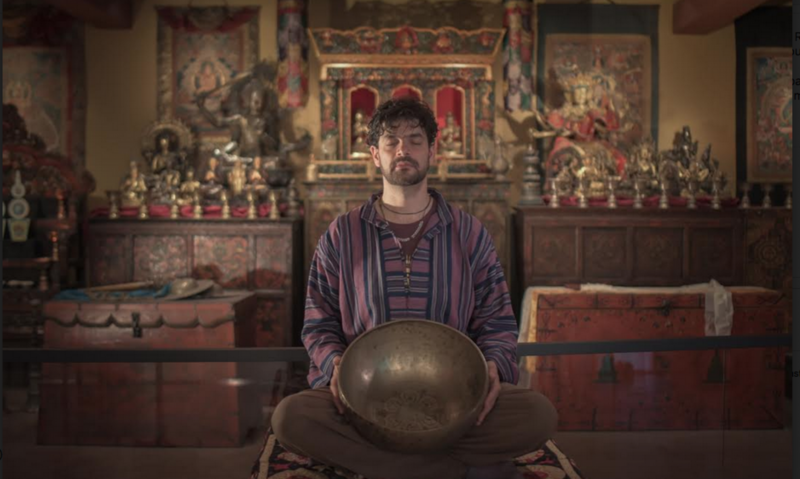 Brooklyn Raga Massive will launch its Pioneer Works residency with a special concert celebration, a retrospective of it’s popular and joyful Africa/India Series. 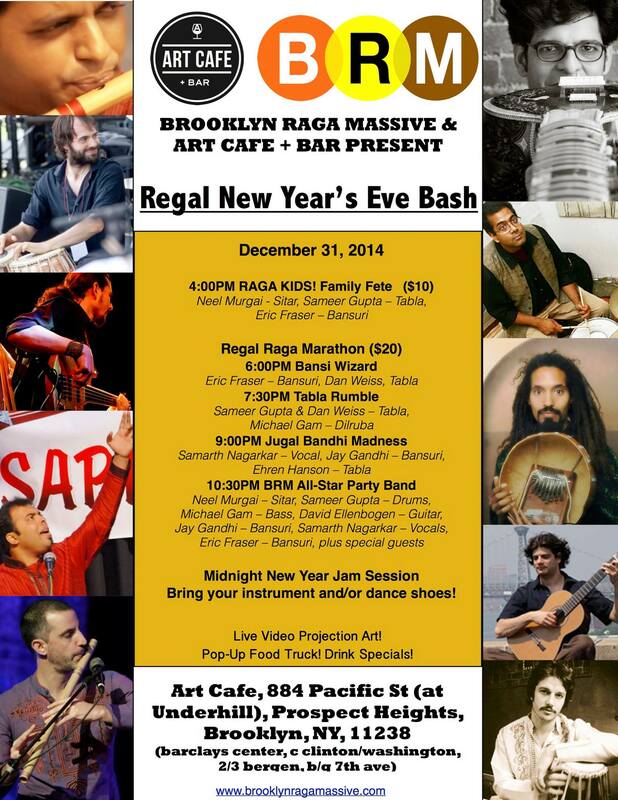 For over a year now, Brooklyn Raga Massive, NYC Radio LIve and Afro Roots Music Nights teamed up to bring African and Indian artists together for a popular series of monthly concerts. These shows have included great musicians including collaborations with Mali’s Yacouba Cissoko, the Moroccan group Innove Gnawa and the OM Gam Ensemble. The majority of these have been archived on the podcast www.nycradiolive.org and broadcast on WKCR 89.9 FM-NY. 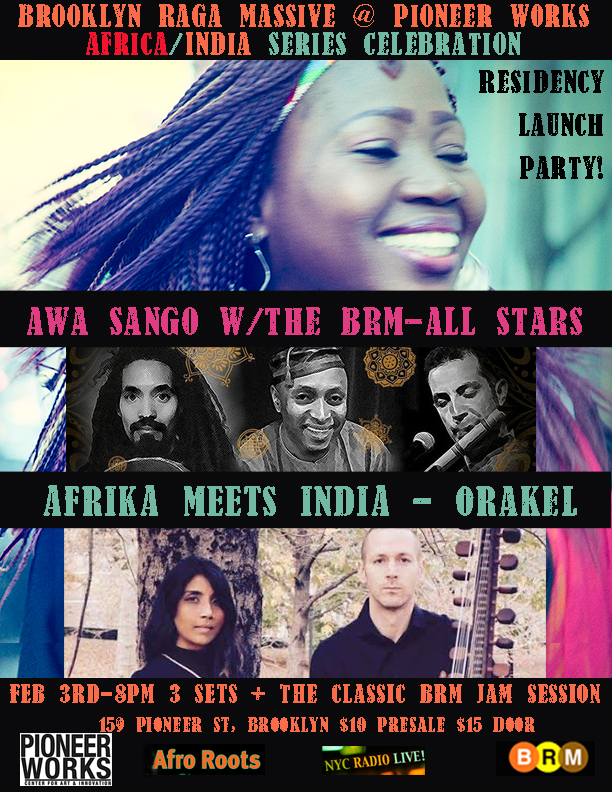 For Feb 3rd’s special triple bill, we will be presenting the legendary “golden voice of Mali,” Awa Sangho, supported by the Brooklyn Raga Massive All-Stars, the fresh new electro-acoustic Kora/Tabla duo Orakel made up of Kane Mathis and Roshni Samlal and the original band in this new genre Afrika Meets India, led by Kevin Nathaniel on Mbira and Eric Fraser on Bansuri. Dancing shoes strongly recommended! Additional musicians involved in the evening include, Giancarlo Luigi, percussion, David Ellenbogen, guitar, Sameer Gupta, tabla, Daniel Moreno, Percussion, Joshua Geisler, Bansuri; Salieu Suso, Kora, Michael Gam, Bass, Neel Murgai, Sitar, Arun Ramamurthy, Violin and other special guests. ‘Music is made of three elements: singing, instruments and dance’ – Pt Birju Maharaj. Ragas in Motion opens the stage to honor a rich global history of collaboration between dance and music artists. We are showcasing a diverse program of solo dance works, all deeply rooted in Indian tradition and accompanied musically by members of BRM. The evening embodies vibrant conversations in Kathak, contemporary and physical theater and is certain to show the language of dance as a powerful voice. Featuring Parul Shah, Parijat Desai, Andrea Clinton and Delhi Dance Theater who are joined in music by Max ZT, Roopa Mahadevan, Kensuke Shoji, Mike Lukshis and many more! Jugalbandhi brings together two melodic instrumentalists in what is normally a more soloistic form. To have true dialogue is a rarefied art, a special subdivision of Indian classical music. 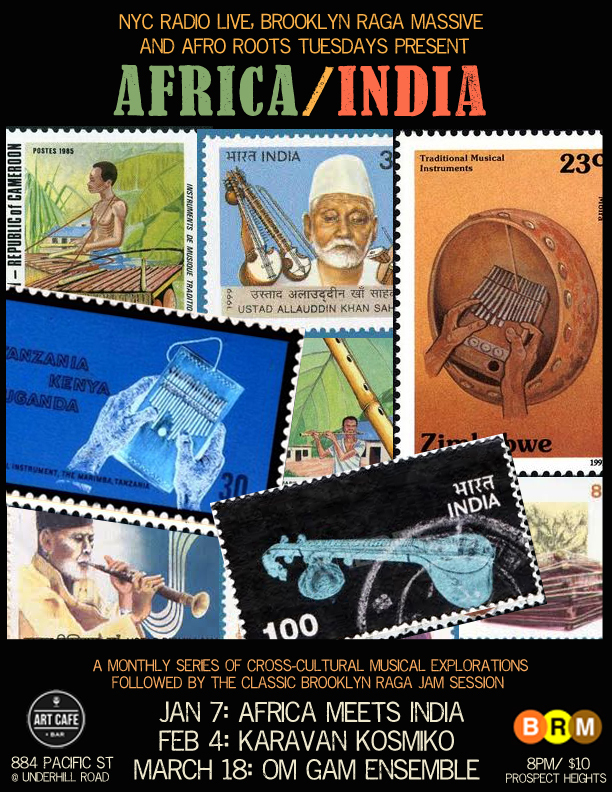 Art of the Jugalbandhi showcases 3 duets; the bansuri players, Steve Gorn and Eric Fraser, carnatic violinist Arun Ramamurthy with North Indian sarod player Anupam Shobhakar, and the dynamic duo of Abhik Mukherjee on sitar and Jay Gandhi on bansuri. Perhaps no one is more responsible for bringing awareness to the beauty of raga to Western music lovers then George Harrison and the Beatles. In an ambitious production worthy of the epic subject matter, the Brooklyn Raga Massive All-Stars return the love. The musician collective will re-interpret and re-contextualize the classic Indian inspired material by the world’s most beloved band. North Indian classical music presented in its pure form. This form is most often represented with one singer or instrument in interplay with the tabla. We go back to our raga roots as vocalist Samarth Nagarkar, and sarod player Anupam Shobhakar color your mind. Bringing the raga back in raga massive! In celebration of International Women’s Day, BRM will present projects led by women of the massive, featuring them in a colorful palette of song, dance, rhythm and visual arts. This multidisciplinary performance will take you on a journey through pure Carnatic (South Indian) vocal music by Roopa Mahadevan, Karavika’s “Raga Chamber Folk” string ensemble in collaboration with contemporary dancer Parijat Desai, Camila Celin’s Devi Tribute, an ensemble honoring the Divine Feminine through song, and visual art collaborations with Seema Pandya. Come celebrate women’s powerful role in the arts as we tell our (Her) story. Raga means ‘that which colors the mind’ so tonight BRM provides the soundtrack for a visual feast to think on. They will work with video artists and screen scenes from classic golden era Bollywood and beyond. Masala popcorn treats available. Holi is a festival of colors in celebration of spring. Come welcome spring with featured performers including khayal and thumri singer Sangeeta Lahiri and ghazal and folk singer Kiran Ahluwalia with guitarist Rez Abassi. BRM has a full schedule of activities including the throwing of colors, a family performance by Raga Kids, special spring food treats, Indian classical and more. Carnatic music, the South Indian classical style is presented in its pure form. Explore the beautiful intricacies of Ragam, Tanam, and Pallavi in two Carnatic kutcheris (concerts). Pioneering virtuoso guitarist Prasanna presents a traditional instrumental set with mridangist Akshay Anantapadmanabhan. Then vocalist Ashvin Bhogendra teams up with violinist Arun Ramamurthy to engage the audience in a powerful set of song and improvisation. BRM celebrates the maestro’s birthday as special guest and long time student of Pt. Ravi Shankar, Pt. Krishna Bhatt performs an Indian classical raga composed by Shankar. A second set will feature the BRM Orchestra performing original works of Ravi Shankar from his collaborations with Philip Glass and George Harrison, as well as original compositions from Pt. Krishna Bhatt in dedication to India’s most famous ambassador. BRM musicians Camila Celin (sarod) and Ehren Hanson (tabla) traveled to Cuba in December, performing in a citizen’s diplomacy initiative. BRM returns the favor as Ehren and Camila collaborate with guest musicians from Cuba and local masters. Raga Cubana intends to blend these two traditions by truly mixing it’s elements in the core. Expect Cuban rhythms with raga melodies. The BRM All-stars pay tribute to their rock favorites with raga reinterpretations. They will explore the long lost connection between 1700’s carnatic composer Tyagaraja, and 1970’s Led Zeppelin. Expect droning, psychedelic arrangements of Jimi Hendrix, Pink Floyd, Radiohead and more. On the last night of their residency, BRM celebrates 4 years of weekly programming with special guest, Karsh Kale. Karsh is a global star who has long bridged the gap between Indian classical, electronica, rock and more. Karsh collaborates with Max ZT, Priya Darshini and other BRM members for an epic culmination to their Pioneer Works Residency. Pioneer Works is a center for research and experimentation in contemporary culture. Through a broad range of exhibitions, performances, arts and science residencies, and educational programs, Pioneer Works seeks to transcend traditional disciplinary boundaries, foster community, and provide a space where alternative modes of thought are supported and activated in tangible ways. The organization was founded in 2012 by artist Dustin Yellin and is located in a 25,000-square-foot manufacturing warehouse in Red Hook, Brooklyn. After an extensive renovation, the facility now houses artist studios, exhibition and performance spaces, a science lab, a recording studio, and other spaces as needs arise. The floor plan is open and flexible, encouraging a transparent, collaborative environment where international artists, musicians, scientists and educators can co-exist and create together.